Editor’s note: Viz Variety Show is a new series that aims to help you go beyond bar charts and line charts. The series will showcase various types of visualizations and outline how to build them, when they should be used, and when they should be avoided altogether. 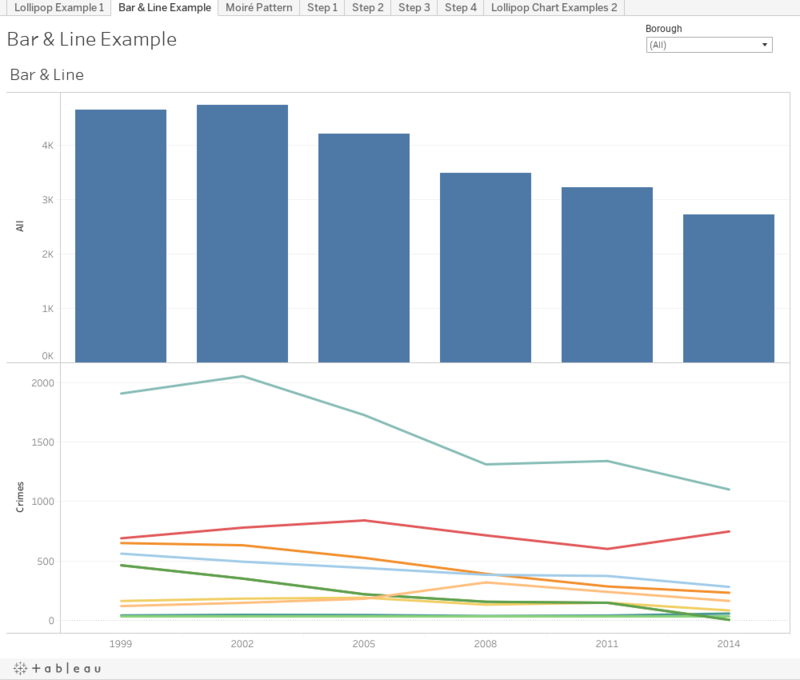 This post builds on Tableau's own Andy Cotgreave's original tutorial on lollipop charts. Let’s be honest—some variant of bar charts and line charts are the best choices in terms of visualization best practices for the vast majority of the vizzes any of us will ever create. However, I think a chart’s appeal is sometimes more important than the best practices of the visualization you’re showing. Others would disagree. But you know what? I’m just going to say it. Nothing but bar charts and line charts is boring. It just is. Why not focus as much on the visual appeal of a chart as much as we do on the accuracy of the data and the interactivity of the dashboard? 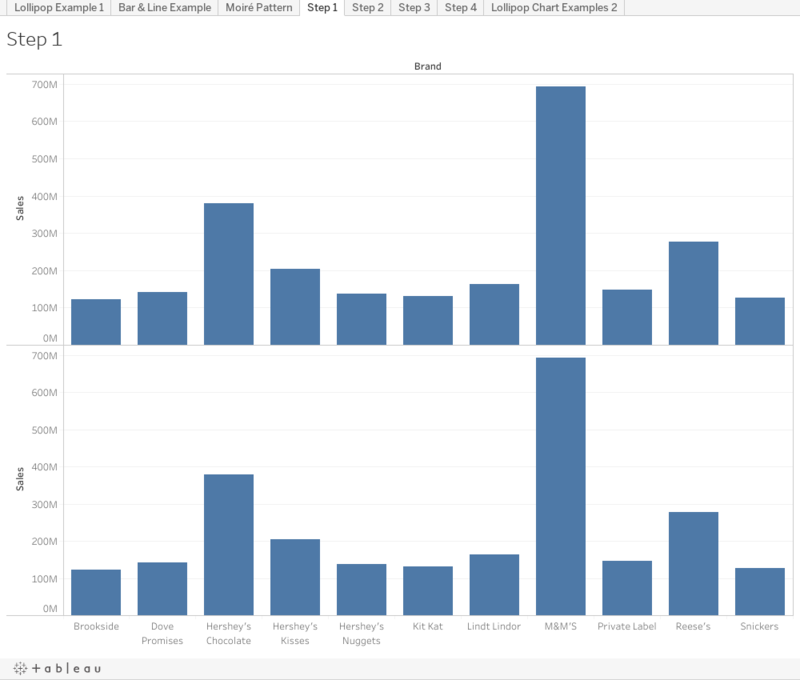 This applies to every part of a dashboard: titles, legends, filters, colors, and, yes, the chart type. 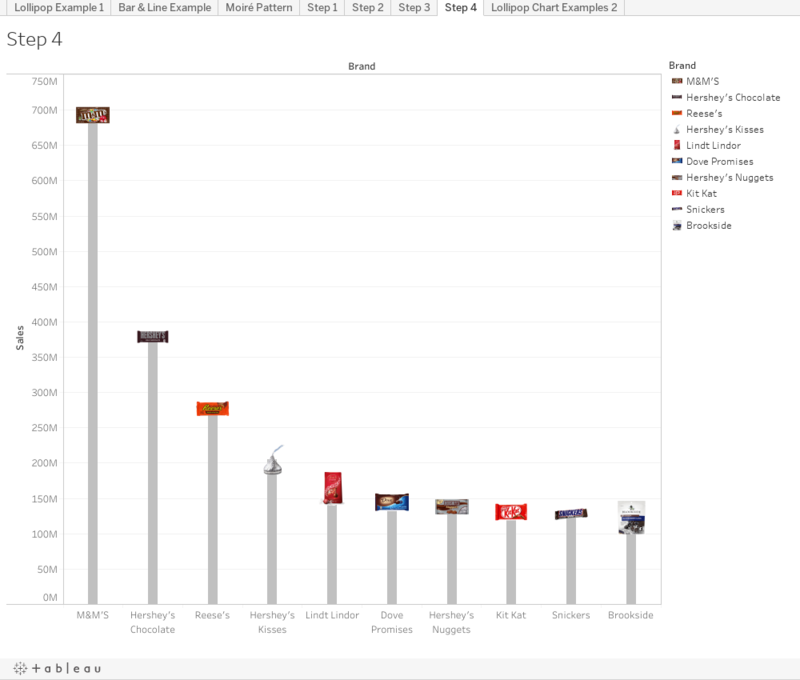 Unfortunately, aesthetic is often the last criterion used to evaluate which chart type is best. If your audience doesn’t find a dashboard or a visualization engaging, they are already starting out less interested in what you’re showing. Worst case, this means they’re moving on after only a glance at your hard work. Final disclaimer: A standard bar chart is the best-practice choice here, so you should only read on if you’re an artist, an anarchist, or both. It’s hard to ignore that the bar chart dominates the dashboard. There are standard techniques you could take to try to mitigate this such as changing the size or position of the sheet, thickness or saturation of bars, orientation, etc. For any number of design reasons, these are not always a valid option. The larger and more saturated these bars are, the more likely you are to experience a nasty little optical effect called a Moiré pattern/effect. This is when you start to see “patterns” that don’t exist due to your senses being overloaded by what your eyes are taking in. 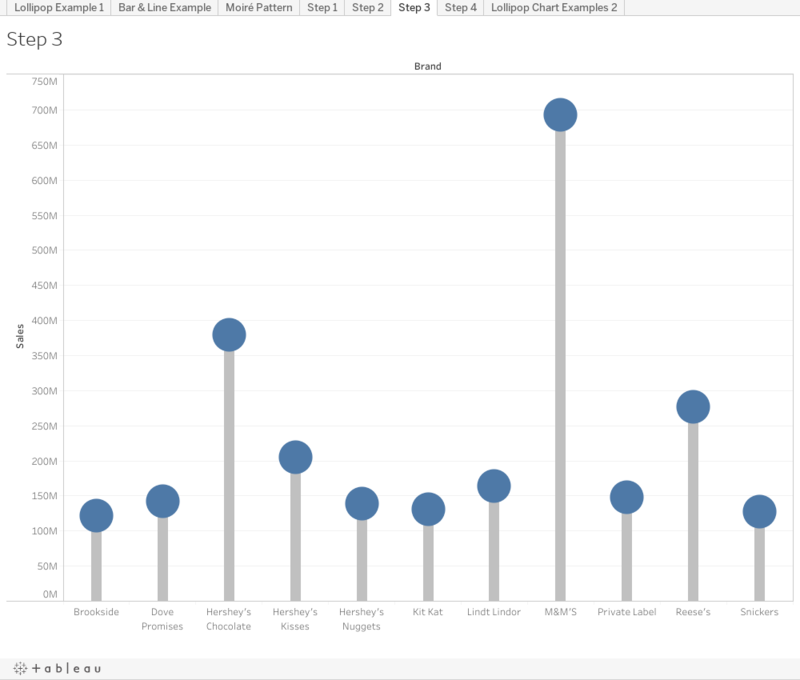 Build a bar chart and duplicate your measure on Rows or Columns. 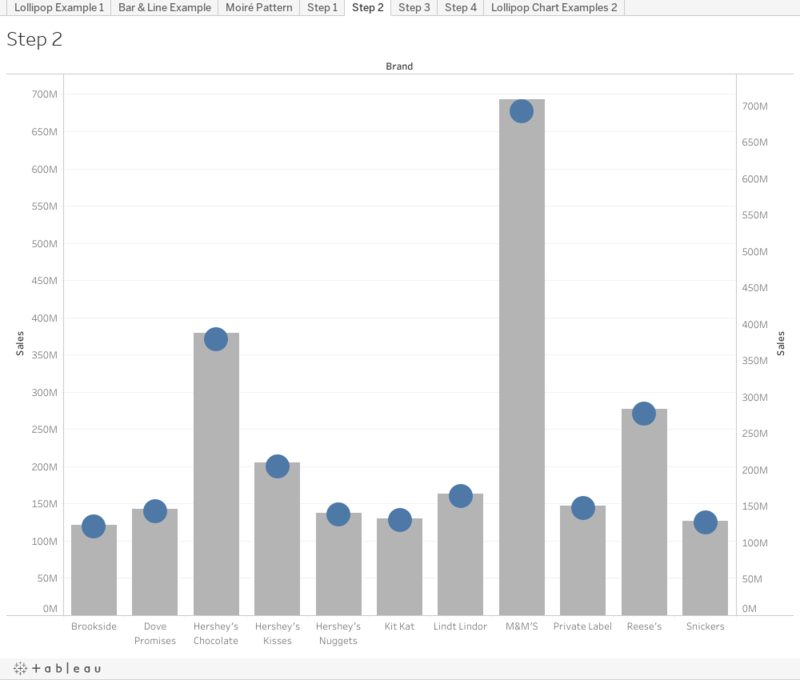 Create a dual axis of your measures by right-clicking the second measure (or second axis) and selecting “dual axis.” Tableau will likely convert these both to circle charts if you leave the mark type set to automatic, so now is a good time to override the first measure type and switch this to bar. You’ll also want to make the bars a lighter color. I usually use a lighter gray, but pick whatever fits your dashboard best. Hopefully you can see the resemblance and why the chart gets its name, and now you get to make your final design decisions on the lollipop chart. You can choose to color the circle based on some KPI logic or by another measure. You can also include custom shapes (you can find a good article on this technique here) which is what I will do. This is as simple as changing the mark type of the circles from "circle" to "shape" and assigning the correct shapes from your repository. And now you've got a lollipop chart! How do you use this chart type—or how do you imagine using it in the future? Share your use case in the comments below.